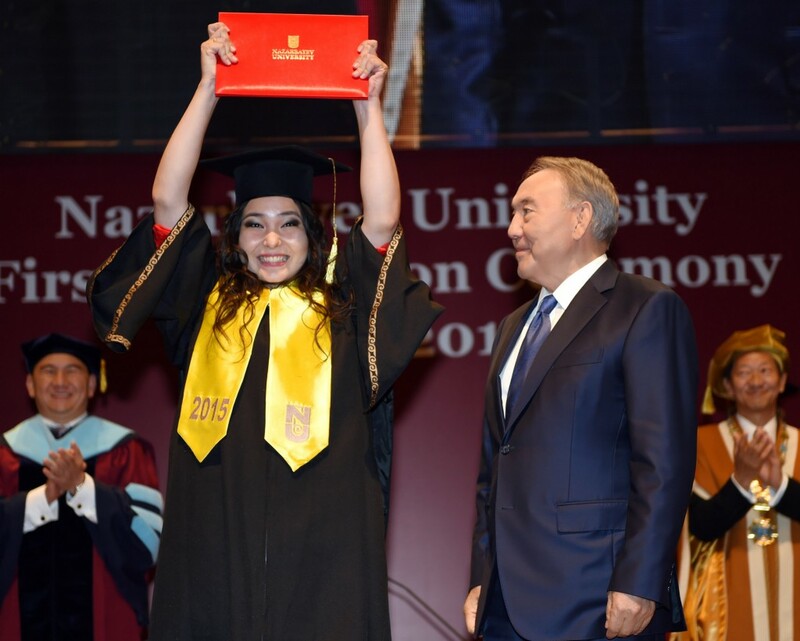 ASTANA – Very few people have the pleasure of awarding diplomas to the graduates of the university named in their honour. 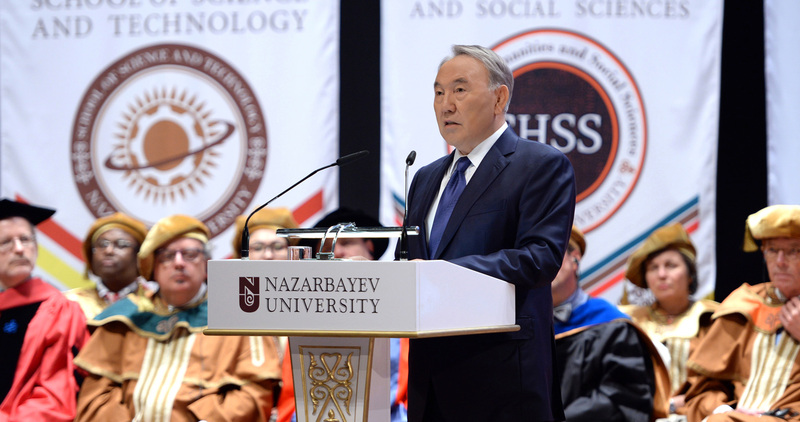 Kazakh President Nursultan Nazarbayev had that opportunity June 15 as he participated in the presentation of sheepskins to the first 446 students to complete their bachelor studies at Nazarbayev University. The ceremony began with words of gratitude from the President to the university staff and parents of the soon-to-be alumni. “The first graduates of the flagship of higher education, first scientific and educational centreat the international level in our history, are about to become a part of the working society of Kazakhstan. Our country gets a new generation of young, fully-trained, skilled professionals. This is especially important now when we are about to start the deep transformation based on the Plan of the Nation of the modernisation of the country,” he said. The university will provide knowledge, scientific discoveries and innovations to Kazakhstan’s economy and life, Nazarbayev added. The President believes the graduates will expand awareness about the nation through their professionalism, patriotism and leadership. 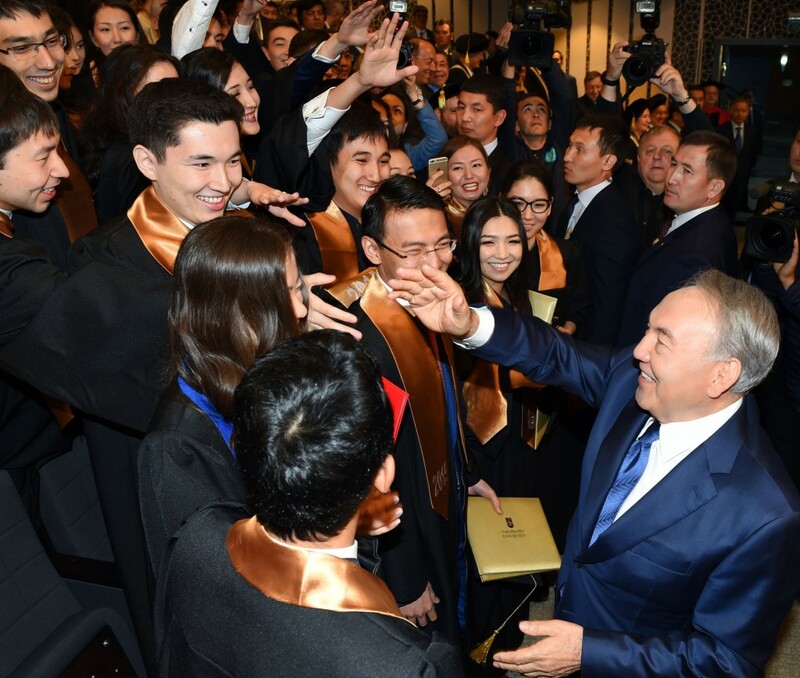 At the end of his speech, Nazarbayev noted thousands of students were also getting their diplomas from other schools throughout the country. He noted UNICEF estimates Kazakhstan ranks 27th in the Global Youth Development Index, a higher position than countries such as France, Sweden and Turkey. “Everything we do today, we do for you and your future. Today, doors to the whole world are open for you. You live in an interesting period of time and grow along with the country. This is a result of peace and stability in our society. Therefore, your main mission is to strengthen the unity and harmony in the country. I wish you all peace and farewell,”said Nazarbayev. President of the university Shigeo Katsu and Kazakh Minister of Education and Science Aslan Sarinzhipov also congratulated the alumni on the historic occasion. “We are proud of you! You are our first ever graduates. 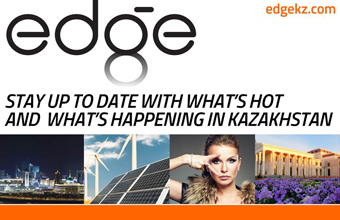 You are the representatives of the new era of higher education in Kazakhstan. You are not only intelligent but brave, because you have begun to learn in a completely new climate of teaching and research,” said Katsu, who has served at the university since its formation. 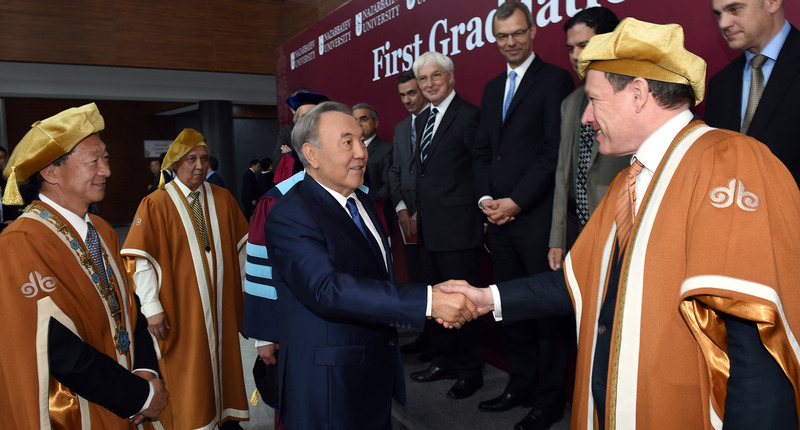 Established in 2010 at the initiative of the President, Nazarbayev University aims to become the first research and world-class university in Kazakhstan. Its activities are associated with the implementation of the main priorities of the country, including the development of advanced research capacity, innovation in technology and industry and the transition to a system of education that meets the demands of a changing and globally-integrated economy. The academic process is based on international educational standards, which contributes to the advancement of the Kazakh education system and takes it to the international level. It is the first university in Kazakhstan committed to working in accordance with those standards and guided by the principles of autonomy and academic freedom. In the last five years, the total number of students has increased to 2,800 in seven schools. Grants are awarded annually to 500 student applicants who receive the highest scores on an exam administered by the university. The students’ living costs for the duration of their study are covered by the state educational grant. The greatest numbers of students are trained at the School of Humanities and Social Sciences, as well as School of Science and Technology, School of Engineering, Graduate School of Education, Graduate School of Public Policy and Graduate School of Business. Among the popular specialties are computer science, mechanical engineering, robotics and mechatronics, education management, biological sciences, electrical and electronic engineering and construction engineering. 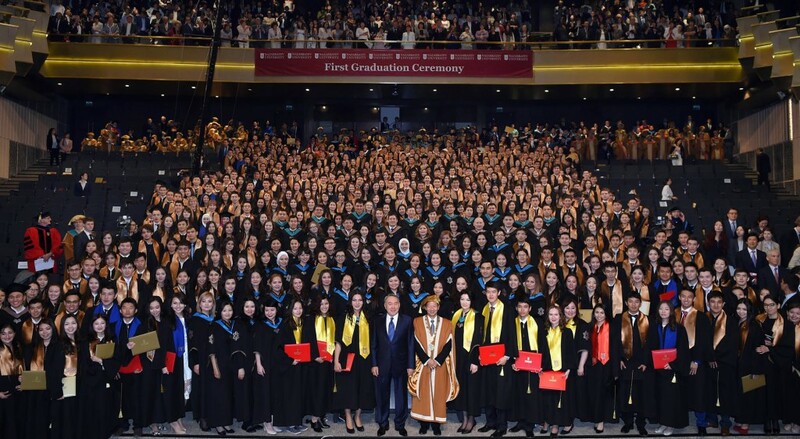 Commencement was attended by the students, their parents and teaching staff, managers of large national companies and other guests.